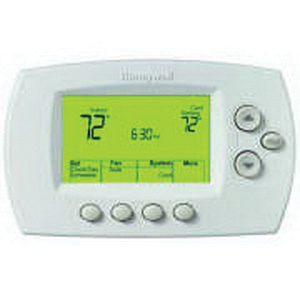 Honeywell Programmable wireless thermostat with five stages, has voltage rating from 20 to 30-Volts AC, current rating from 0.6 to 1-Amp and power rating from 10.8 to 30-Watts. The battery powered thermostat with thermistor sensor, has temperature rating from 40 to 90 deg F. It is RedLINK™-enabled to work with the RedLINK™ internet gateway, portable comfort control and wireless outdoor sensor. The equipment interface module easily wires to the equipment to communicate with the Wireless FocusPRO and the Return Air sensor wires to the equipment interface module for backup control if homeowners forget to change batteries. It is suitable for gas, oil, electric, heat pump, forced warm air, hot water and steam or gravity.